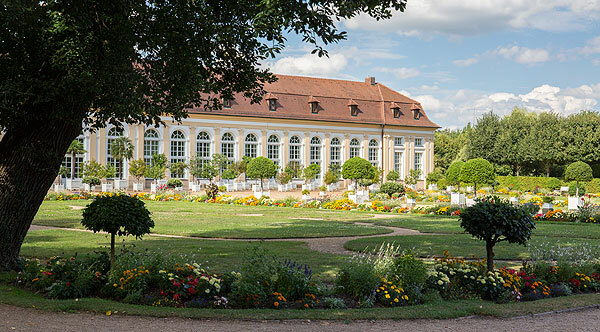 The Ansbach Residence has its own court garden with an orangery, although it has almost always been separated from the palace by other buildings. The orangery was built from 1726 to 1743 with a parterre in front of it and two avenues of lime trees on either side. Running parallel to the façade is the main axis of the garden with two double rows of high lime hedges. In spring and summer the parterre is planted with a wide variety of flowers in designs based on baroque pattern books. In the summer the orangery produces an assortment of lemon, Seville orange, olive, pistachio, laurel and fig trees grown in tubs. There are monuments and commemorative plaques to the botanist Leonhart Fuchs, the poet Johann Peter Uz, the margravial minister Freiherr von Benkendorff and the foundling Caspar Hauser, who was murdered in the court garden in 1833. 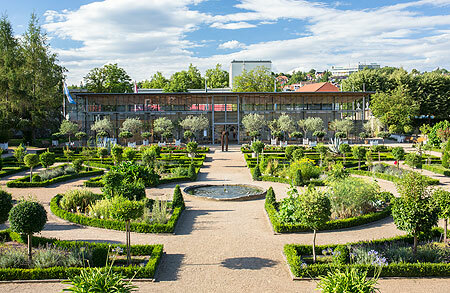 In 2001, to mark the 500th birthday of Leonhart Fuchs, an interesting garden containing many different varieties of medicinal herb was laid out. The orangery is suitable for banquets, concerts and receptions up to 1.088 persons. The Dome Hall is suitable for banquets and receptions up to 300 persons. The foyer is suitable for receptions and small exhibitions up to 200 persons.